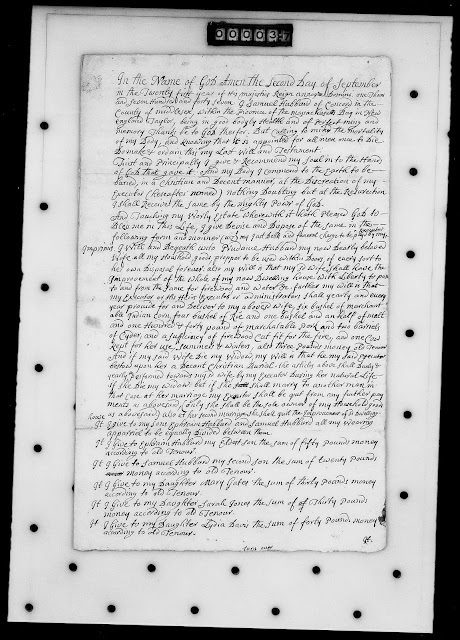 Genea-Musings: Amanuensis Monday - 1747 Will of Samuel Hubbard (1687-1753) of Concord, Mass. 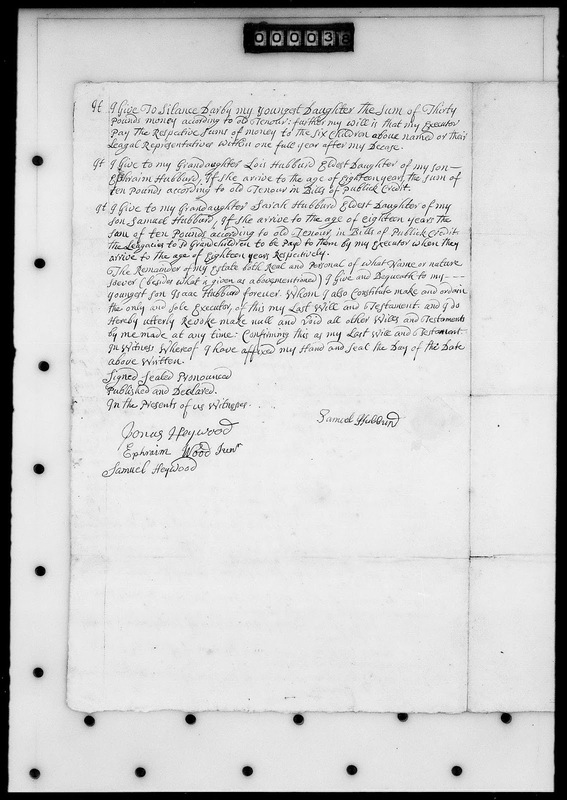 Amanuensis Monday - 1747 Will of Samuel Hubbard (1687-1753) of Concord, Mass. Do make & ordain this my Last Will and Testament. I Shall Receive the same by the mighty Power of God. following form and manner (viz^t) my just Debts and funeral charges to be payd by my ^Executors. kept for her use, summers & winters, also three pounds money old Tenour. apparriel to be equally Divided between them. money according to old Tenour. Leagal Representatives within one full year after my Decase. ten pounds according to old Tenour in Bills of publick Credit. sum of ten pounds according to old Tenour in Bills of Publick Credit. arrive to the age of Eighteen years Respectively. 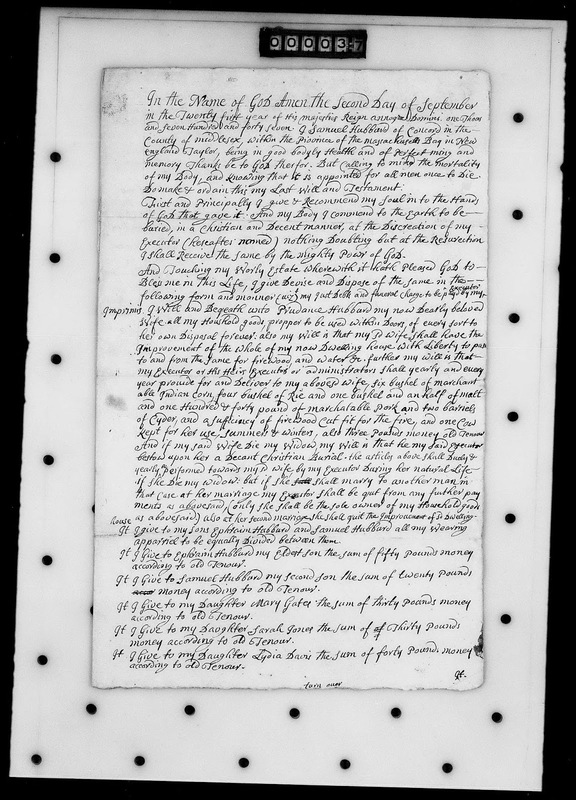 "Middlesex County, MA: Probate Papers, 1648-1871," digital image, Ameircan Ancestors (http://www.AmericanAncestors.org : accessed 6 November 2016), Probate Packet #12,200, will of Samuel Hubbard, 1747; Original data from Middlesex County [Mass.] Probate Court probate packets. Samuel Hubbard (1687-1753) was married twice. By his first wife, Sarah Clark (1681-1720) who he married in 1709 in Concord, he had five children, Ephraim, Mary, Samuel, Sarah and Lois Hubbard. By his second wife, Prudence Temple (1692-????) who he married in 1721, he had three children, Silence, Lydia, and Isaac Hubbard. The will was presented to the Middlesex County Probate Court on 28 January 1754 by executor Isaac Hubbard and witnesses Jonas Heywood and Ephraim Wood, Jr. No inventory, account or distribution was included in the probate packet. The will names seven children and two grandchildren. He gave money to six of the children and the two grandchildren out of his estate, and named his youngest son Isaac, to receive the real and personal property, provide for his mother, and be executor of the will. At the time of the writing of the will, Isaac was age 18, and at his father's death, he was 24. My descent from Samuel and Sarah (Clark) Hubbard is through their eldest daughter, Mary (Hubbard) Gates (1712-1754), who married Amos Gates (1706-1783) in 1732. Samuel and Sarah (Clark) Hubbard are my sixth great-grandparents.